Multihulls are famously stable. But the fact that they don’t heel also means their rigs carry higher loads. Unlike a monohull rig, a multihull rig must stand up to gusts and changes in wind direction. With regard to running rigging, most modern catamarans now also sport large positive-roach mainsails, which further amp up the loads on things like the mainsheet, halyard and vang. By comparison, working jibs tend to be fairly small, although more and more multihulls are being equipped with reachers, screechers and other large downwind headsails. typically used for mooring lines; around 30-40 percent more elastic than most high-tech cordages. Such a stretchy line is no good for halyards or sail controls. stronger, grippier, with less stretch than nylon; ideal for sheets and most sail control lines. Polyester works well in winches, jammers and clutches. It is also typically soft and flexible to handle. there are various types sold under a number of different brand names, including Dyneema, Spectra and Vectran. These are very strong and considerably less elastic than nylon or polyester. However, because they are vulnerable to abrasion, chafe or UV degradation, they are often enclosed in a soft polyester sheath to protect them and make them easier to handle. For sheets, halyards, reefing and control lines, the anticipated load on a line is usually considered its working load, which should be no greater than 20 percent of the line’s rated breaking strength. Put another way, the line used should be around five times stronger than is absolutely necessary. In some cases, this is overkill—for instance, if the breaking strain of the clew or headboard of a sail is considerably less. Still, it’s a good guide for general applications. The aim here is to keep stretch to a minimum to prevent the luffs of your sails from going slack over time. Dyneema is ideal for such continuous high loads. Although it’s more expensive, size for size, in most cases you can go down one size compared to polyester because of Dyneema’s superior strength. Remember, though, if you reduce the diameter of a line, you must also check the jaws of the rope clutch holding it to ensure it is still within the correct parameters, or the halyard will gradually slip through the locked clutch. Some clutches allow you to change the jaw size rather than replacing the entire clutch. The mainsail halyard on a cruising multihull is usually specced higher than the halyard on a monohull, due to the larger sail area. 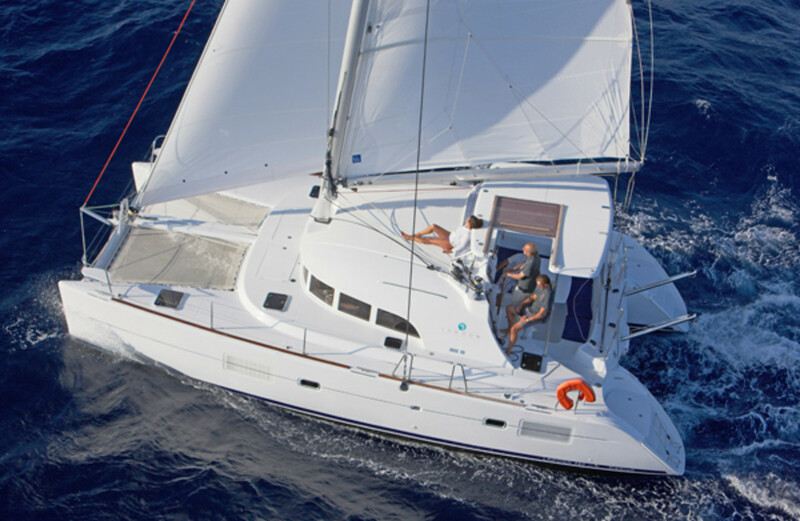 For example, a 45-50ft catamaran will typically require a halyard that is ½in diameter (12mm) Dyneema or 14mm braided polyester. 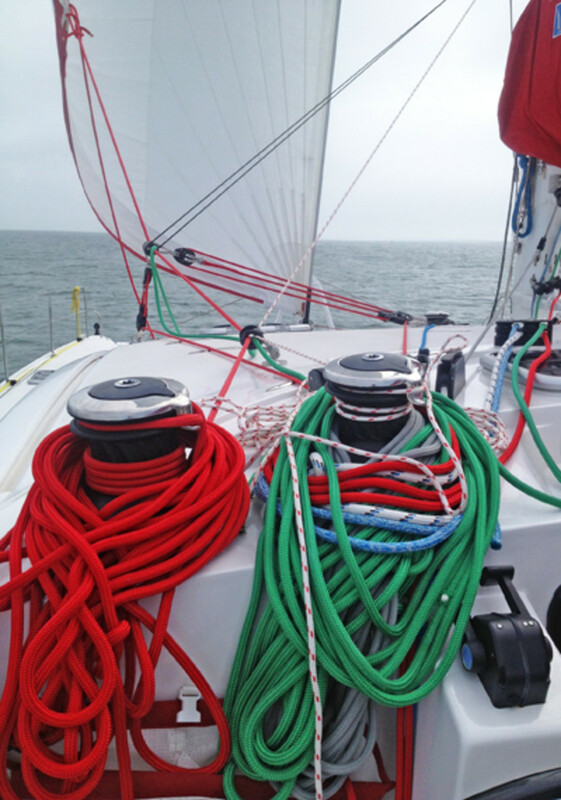 A monohull with roughly the same LOA will require a 10mm Dyneema/12mm polyester halyard. Another consideration when choosing halyards is weight. This is not quite as important on a multi as on a mono—again because of the heeling factor—but it is still relevant. (All boats, for example, are susceptible to pitch.) Weight can be slightly offset by using Dyneema loops instead of metal shackles at the headboard. Although it’s important to ensure the lines you select for your running rigging will work well within the safe load limits of your boat, you also don’t want to over-specify your line for economic reasons: large-diameter and/or exotic high-modulus line doesn’t come cheap. When it comes to sheets, another consideration is ease of handling. In fact, a 10mm line is probably the smallest that can comfortably be pulled by hand under extreme load. For the best handling lines, a double-braided polyester rope is easy on the hand and plenty strong for most applications. Sta-Set by New England Ropes is a typical cruising option: the line is comfortable but strong and, importantly, can be spliced if necessary for attaching quick-release snapshackles or something similar. By contrast, a ½in (12mm) diameter Dyneema line has a breaking strength of some 10 tons, which are clearly overkill for cruising yachts below 50ft LOA. On a multihull with a large mainsail, the vang is often winched down hard on a downwind run with the boom a long way out. The vang line must, therefore, be as strong as your halyards. 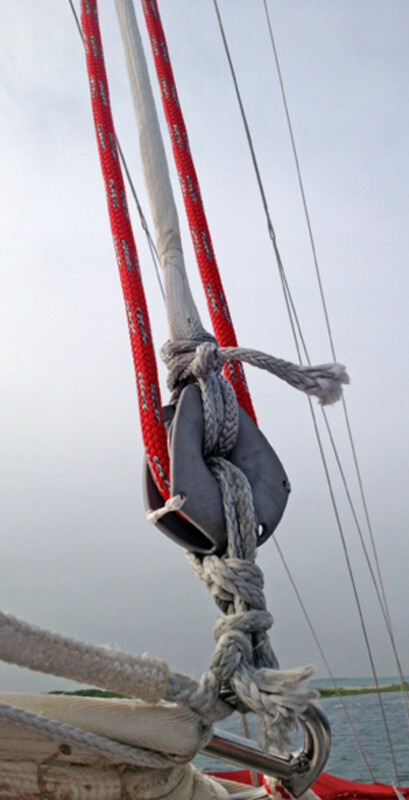 For a 40ft cat, this means using something like a ½in diameter Dyneema or Spectra line. These are usually rated along the same lines as the mainsheet, although one size smaller. In this application, a little stretch isn’t going to cause too many problems. In fact, it will introduce a little give in the system when reefed down hard. Single-line luff and leech reefing led back to the cockpit create a good deal more friction than a simpler system with just a reefing horn and leech line led to a mast winch and boom jammer. Therefore, the former will undoubtedly require a grade and size higher than the latter. Ever since yacht manufacturers started leading all sail control lines aft to the cockpit for easy handling, the friction and load on these lines have increased dramatically. Mainsheets with tracks on the cabin top, which are led along the underside of the boom to the mast, down, around another turning block, then aft to a winch, are far more highly loaded than a simple tackle at the boom end. For this reason, the turning blocks have to be tough and as free running as possible if you want to avoid shattering the sheaves. alleviate chafe on the sheet from slippage.